Entering its third season, the story of the original fallen angel continues. As Season Two came to a close, Lucifer took care of a little problem called Mom, aka Charlotte (Tricia Helfer). But now he’s facing an even greater challenge – finding out who kidnapped him, and why his angel wings are back. In addition, Tom Welling (Smallville) joins the cast as Marcus Pierce, an accomplished police lieutenant who is everything Lucifer (Tom El.. Bored and unhappy as the Lord of Hell, Lucifer Morningstar has relocated to the City of Angels, where he indulges in a heck of a good time. 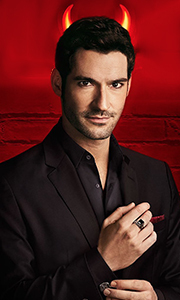 When a beautiful pop star is murdered before his eyes, Lucifer feels something for the first time in 10 billion years. Is it his natural desire to punish the wicked? Or something else - like compassion? When LAPD homicide detective Chloe Decker investigates the murder, she is both repulsed and fasci.. In Season Two, Lucifer Morningstar and LAPD Detective Chloe Decker are back solving murders on L.A.'s white-hot streets, with their relationship growing deeper, closer, and more awkward for them both. To add fuel to the fire, Lucifer's mum, Charlotte, escapes Hell, bringing along a ton of emotional baggage: Now Lucifer and his angel brother, Amenadiel—with whom Lucifer has serious sibling issues - must work together to deal with mommy d..